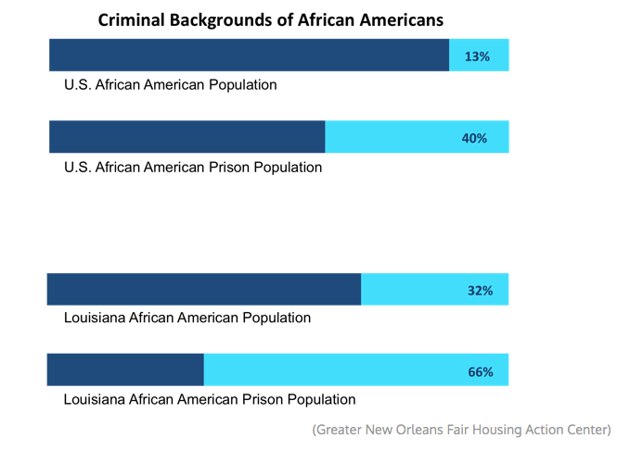 An audit from New Orleans shows that finding a home with a criminal record depends on your skin color. To answer this, the fair housing center tested the housing market by sending a group of people—half of them White, half of them African-American—out to apply for housing advertised on Craigslist and other public listings. There were 50 visits conducted between July and August, which the fair housing center monitored. The prospective “renters” all had matching incomes and identical assorted felonies and misdemeanors ascribed to their profiles. The testers recorded the kinds of responses heard from the landlords they spoke to about the housing. The White testers logged more sympathetic responses—like the ones that opened this article—than the Black testers. This affirmed findings that criminal-background screening is, in fact, being used as a tool to discriminate against African-Americans. The Black testers received “differential treatment” in half of the cases, in addition to other side-orders of discrimination that had nothing to do with their criminal records. Black testers were given inconsistent or inaccurate information about criminal-background policies and were discouraged from pursing certain housing or certain neighborhoods (a practice known as “steering”). By comparison, White testers were often “coached” by landlords about how to circumvent the background checks, or landlords told them they would make exceptions to the screening policies for them. Ms. Smith,* for instance, is an African-American client who paid $70 for a background check when she finally found the perfect home. She had been told over the phone that the apartment complex did not allow felony convictions. After viewing the apartment and submitting an application, she was shocked to be denied because her daughter has a misdemeanor. According to the leasing agent, with whom Ms. Smith spoke when she viewed the apartment, their policy only applied to felonies. One White tester with a misdemeanor was encouraged to apply after being told that the background policy only excluded those with felony convictions. But when the African-American tester mentioned her similar misdemeanor conviction to the same leasing agent, the tester was told that the misdemeanor would result in a denial. One agent who was unsure of the company’s background screening policy told the African-American tester that she was “pretty sure it would be declined” and emphasized that the tester would lose the application fee if denied. That same agent told the similarly situated White tester that the misdemeanor probably would not show up in the background check and that the agent would “do [her] best” to assist the tester through the application process. The fair housing center also partnered with the local legal nonprofit the Justice and Accountability Center (JAC), which does criminal-record expungements, for a survey about real prospective tenants’ experiences for the report. Of those surveyed, 75 percent reported having trouble finding decent housing because of their criminal records. Half of the respondents were in a homeless shelter or staying with family or friends when surveyed. Such discrimination is especially consequential in New Orleans due to its extraordinarily high incarceration rates, its lack of public-defense resources, and the “debtor prison” culture of the city’s criminal-justice system. Lawyers recently filed a federal class-action lawsuit challenging that culture, which advocates say exploits and incarcerates people of meager resources through fines for minor crimes. Ms. Green* had rented a car just before Hurricane Katrina. She was going to return it when the mandatory evacuation was ordered, and she kept the vehicle to evacuate her family. Although Ms. Green had no previous criminal history, the Jefferson Parish District Attorney charged Ms. Green with felony auto theft. The conviction has been preventing her from accessing jobs and housing ever since. When she finally moved back to New Orleans, she applied for housing and was denied because of her record. The experience and fear of future denials has since discouraged her from applying for other apartments and for jobs. As a result, her only option has been to live with family. The Greater New Orleans Fair Housing Action Center recommends that HUD and the local public-housing authority adjust its policies so that this kind of discrimination isn’t further enabled. The Housing Authority of New Orleans actually passed new criminal background screening policies in 2013, but it has yet to formally apply them. Tuning up such guidelines seems imperative, but if these 50 cases are any indication of a more widespread practice in the United States, it may be that African-Americans might need to start shopping for housing with their own hidden cameras.